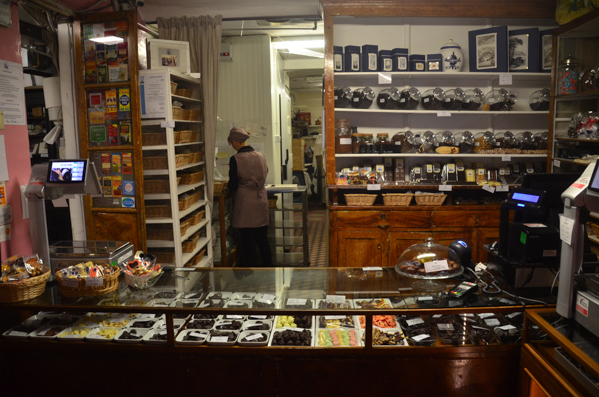 There were 45 chocolate factories just in the historic center of Genoa on the half of the 19th century. Today those survived can be counted on one hand. Among these the ancient chocolate factory Romeo Viganotti founded on 1866. Don’t think that only the sign and the seat remain of the ancient business. Not at all! 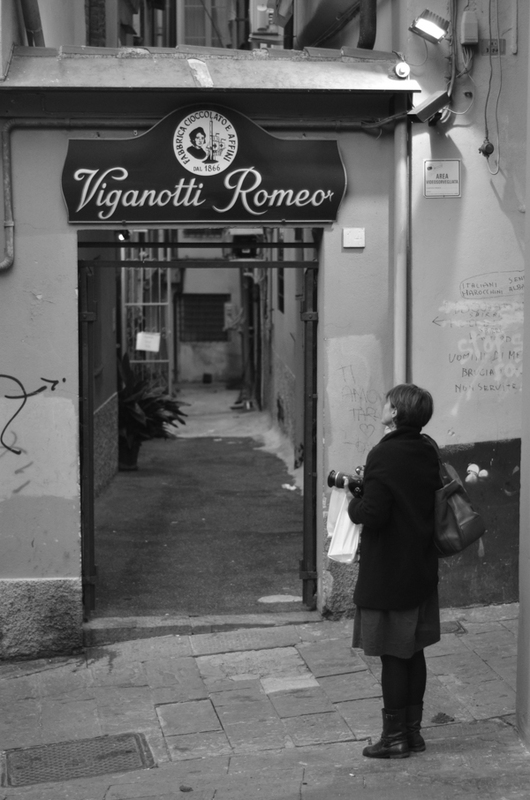 Entering Viganotti shop is like jumping with both feet two centuries ago. First of all the shop has no sparkling windows to attract clients. On the contrary, it is jealously hidden in a small dead-end alley, Vico della Castagna. If there weren’t the recently set up wide sign just at the entrance of the alley, the small brown wood door with frosted glasses would go definitely unnoticed. Once got through the tiny anonymous door (with the due incredulity) you enter in a tiny cozy room with the floor of concrete tiles where thousands of pair of swaying shoes waited in line. The walls shine rosy are surrounded by tall wood shelves plenty of baskets, jars and packets full of colorful sweets, candies and confetti. 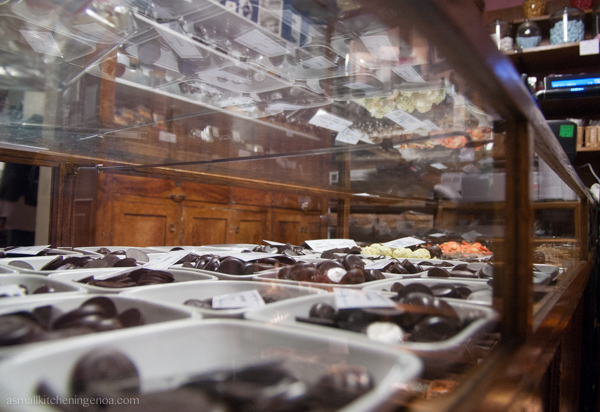 The ancient counter of thin pristine glass – always the same since two centuries – shows in plain view a multitude of small chocolate and pralines of various colours, forms and fillings. Whilst on the back thick white curtains separate the shop from the very factory. Trough them, always slightly open, you can easily peek the old chocolate machines at work. 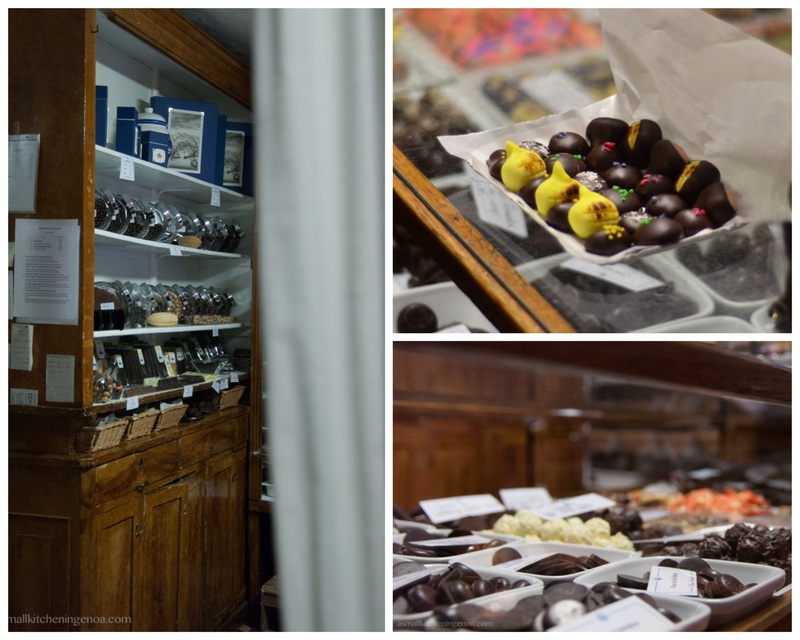 The aroma that invests you entering Viganotti shop is a so familiar one that you immediately recall all those cakes, cookies, ice-creams and pastries made of chocolate you ate with carefreeness during your childhood. Patience and calm characterize the gestures of the people working at Viganotti. 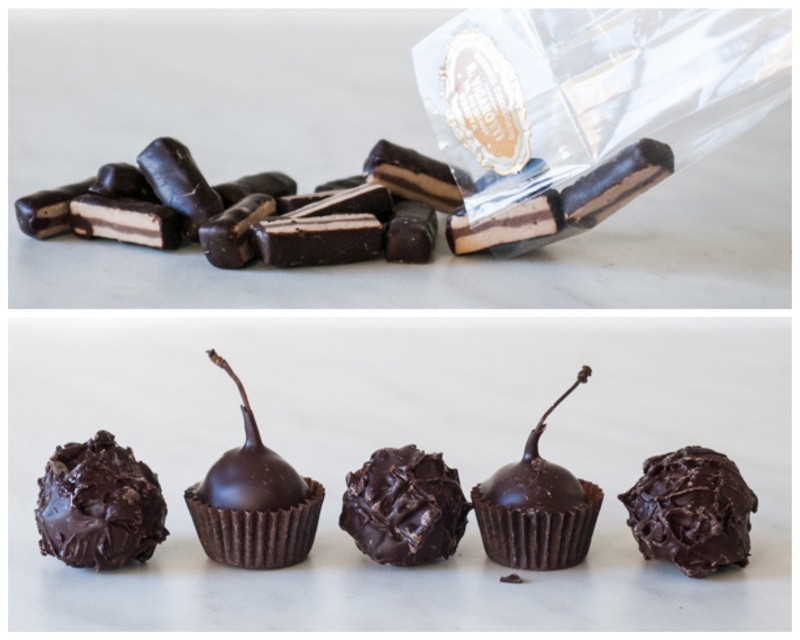 In this factory, in fact, the essential ingredients for each small precious chocolate are time and experience. 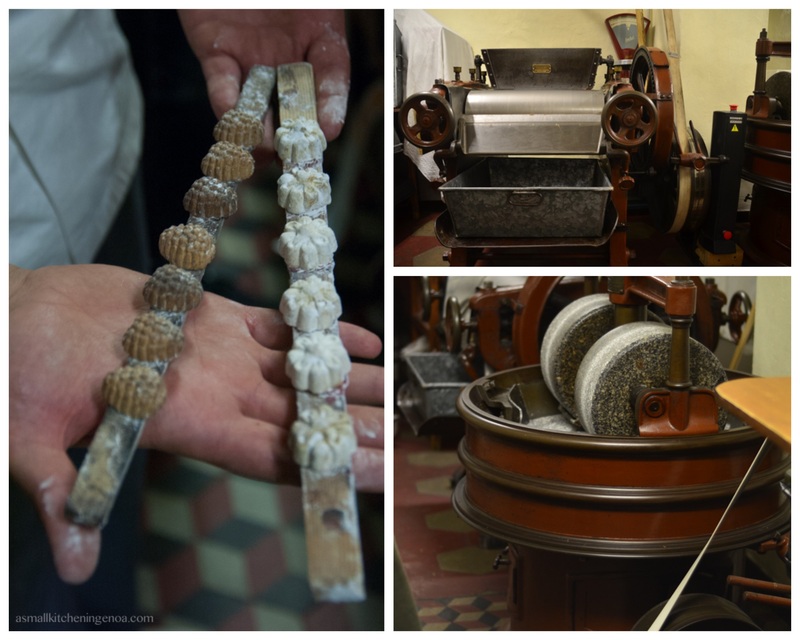 All sweets are produced exactly like they used to, using the very same wood stamps and the very same German machines with heavy stone wheels for grinding chocolate and hazelnut. Guess that those machines were moved just once from the back of the store for being saved from bombs during the second world war! 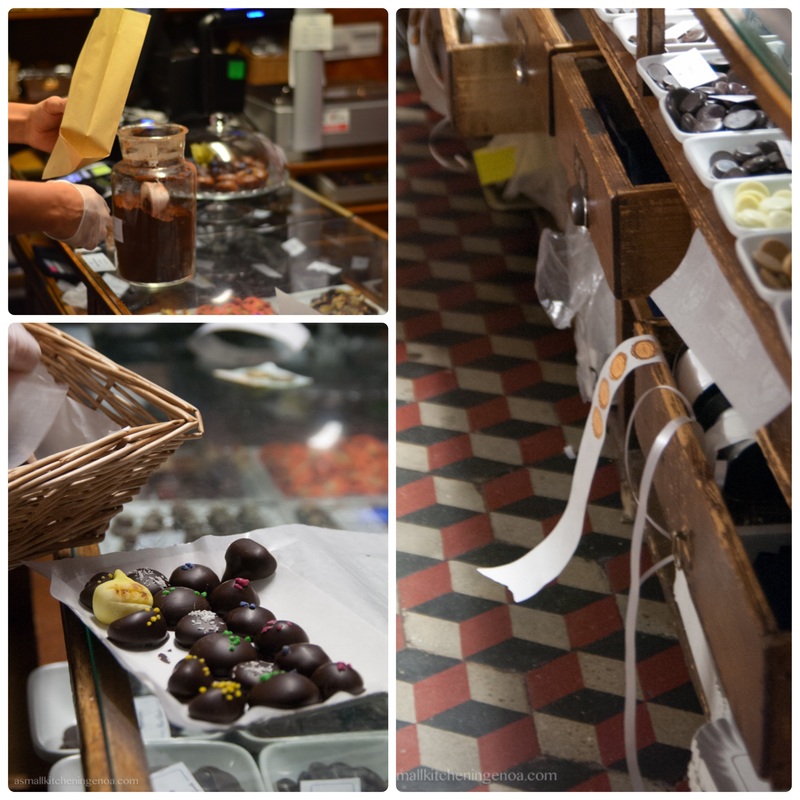 At Viganotti you will never find one praline or confetto exactly like the other. 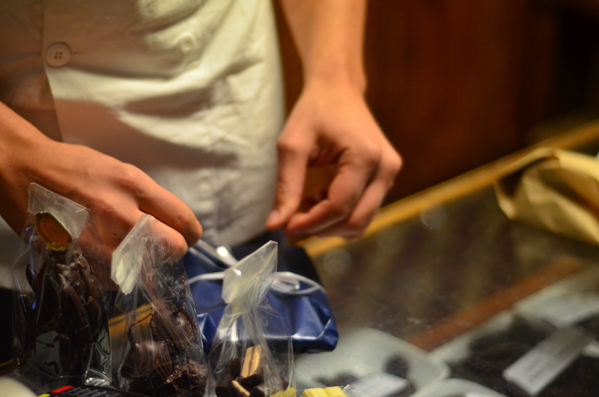 Here everything is processed and cut by hands and the production time is just scheduled by chocolate mood. Its texture and yield, in fact, just depend on the weather, on the humidity of the air actually. 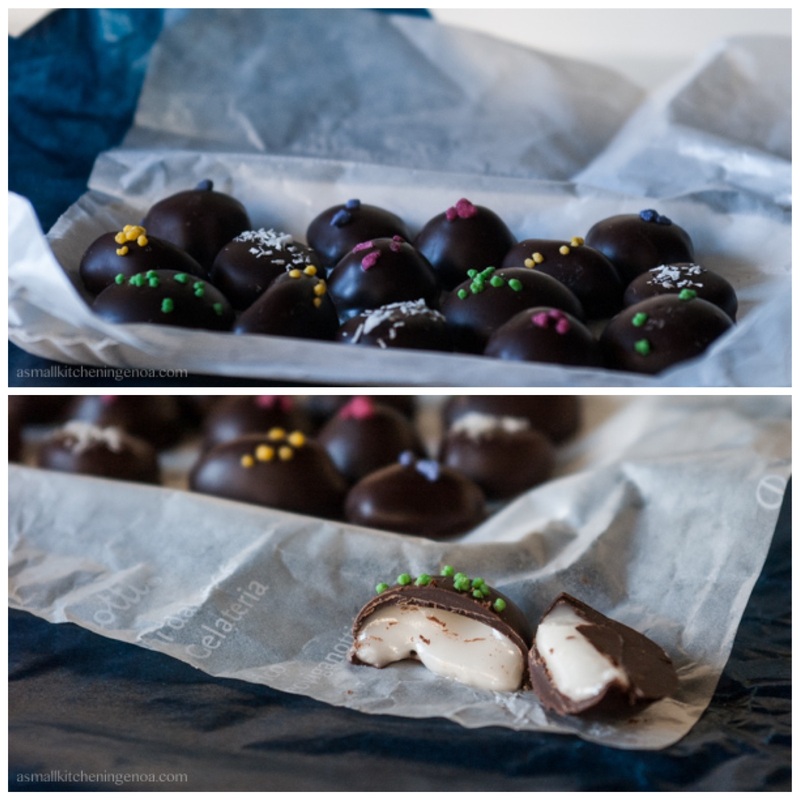 Making pralines– i.e. cover with chocolate peanut brittle, thick sugar creams and other fillings (yes, at Viganotti they make the filling first and then cut and cover it with chocolate) – at Viganotti may take even 5 days! 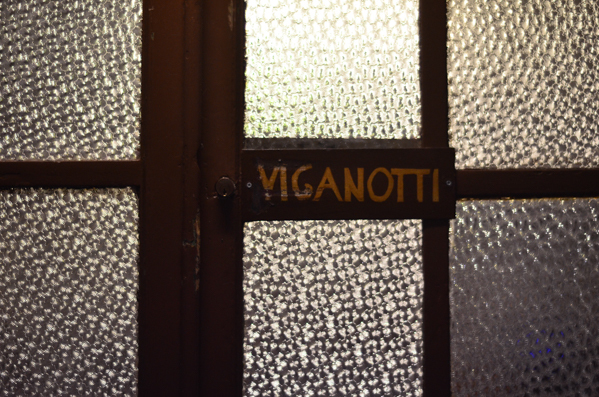 I bet that these are the reasons why the fine crunchiness and silkiness of the so lovely imperfect chocolate of Viganotti are incomparable and kept this small factory alive for centuries making it famous not only in Genoa and Italy but also all over the world. As to raw materials, the current owner Alessandro Boccardo directly and personally choose and purchase chocolate in Ecuador and Venezuela, with no trader involved, so to grant a pure and first class product. 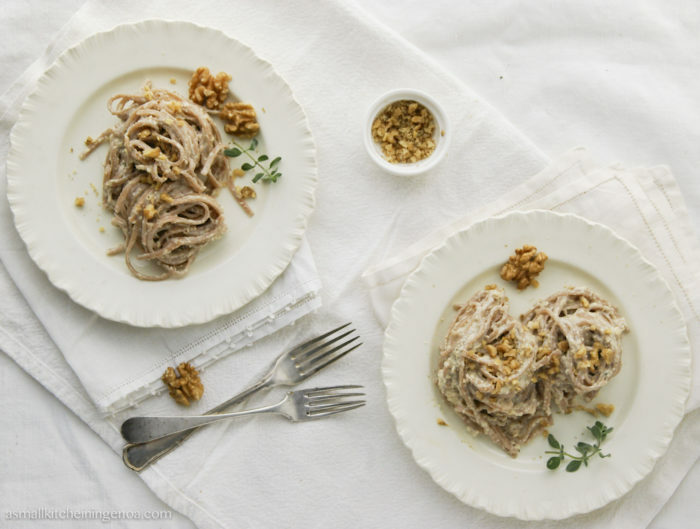 The same for hazelnuts, which are bought once a year in Piedmont from a single small farmer. If you get the chance to come to Genoa and visit Viganotti, the flagship products you must absolutely try are (as you may imagine) the pralines which have different names and different fillings: boeri bear cherry and liqueur inside, croccantini hide peanut brittles, cremini have two different chocolates in alternate layers. And then there are candied orange peels and sugars, small domes of dark chocolate filled with a sugar cream flavoured with mint, rose, violet and vanilla (each bite a big surprise notwithstanding the colourful clues on the top!). 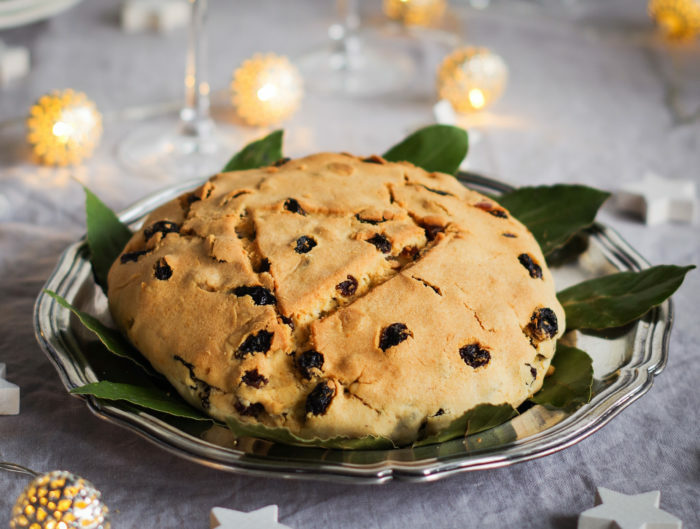 At Viganotti you can also find outstanding “alike” sweets such as confetti, pastries of almond paste (the false chestnuts covered with dark chocolate are wonderful, such a pity you can find them only on fall and winter! 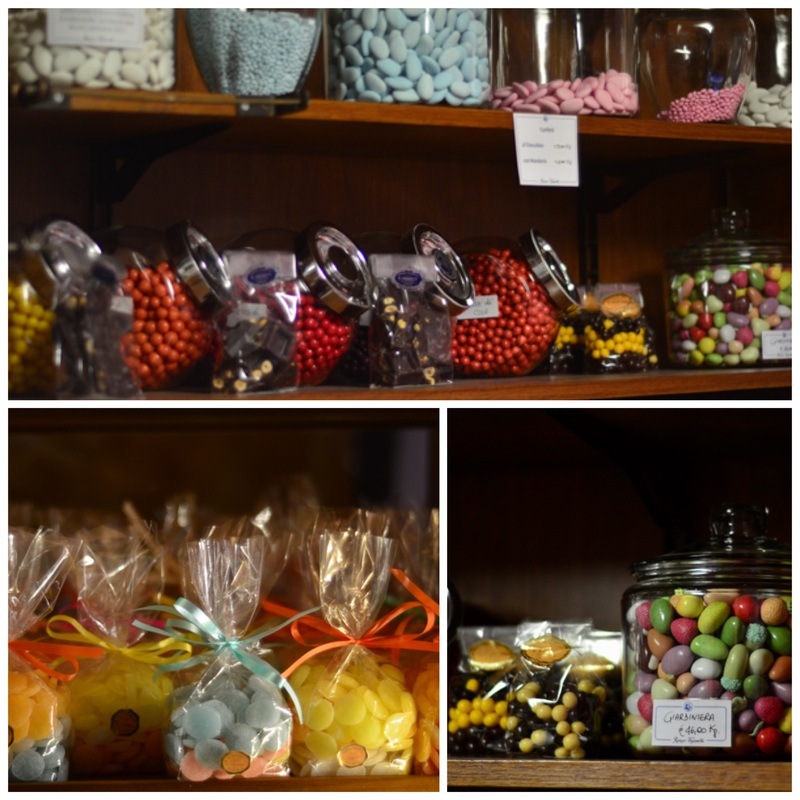 ), pearls of rosolio (tiny balls of sugar of different colours filled with a flowery liqueur) and full-colours ginevrine (sugar mints of different flavours). On Easter, of course, they also prepare excellent chocolate eggs, too good to generate leftovers! 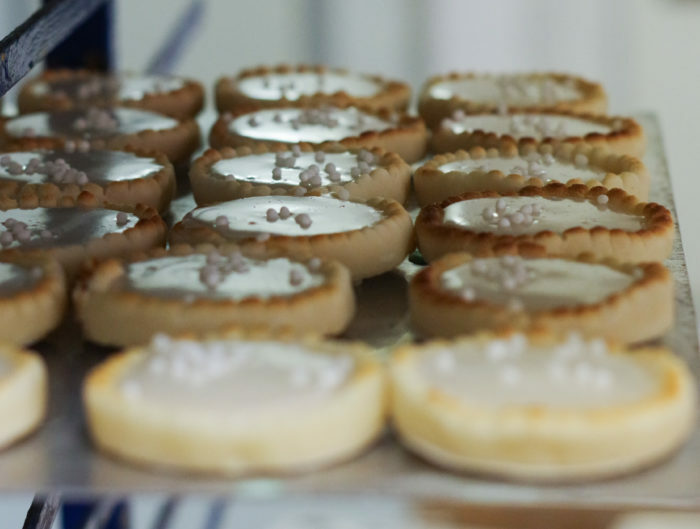 Before living your precious small tray will be carefully wrapped with a sober blue paper, the very same paper used in ancient times to wrap sugar pats and that still nowadays all the elegant old patisseries of Genoa use for packaging their sweet jewels. And this recalls me of my granny when on Sunday she came for lunch at our home. We opened the home door and she was there, standing all dressed up with fur and bonnet, holding in their glove that valuable blue package with small bites of happiness inside.